I like looking out my windows. Sure, on account of work and socials and random walkabouts, I am not here too much but when I am, I often take a little time to stand by the windows and watch the world passing by. Regardless of time, each time that I look out, there’s always someone jogging, walking their dogs, strolling in leisure, etc. At times, matches of ball games are played out, to the cheerings of supporters and passerby alike. This evening, around sunset, whichever way the light fell, it gave a golden glow to the top of trees just outside. 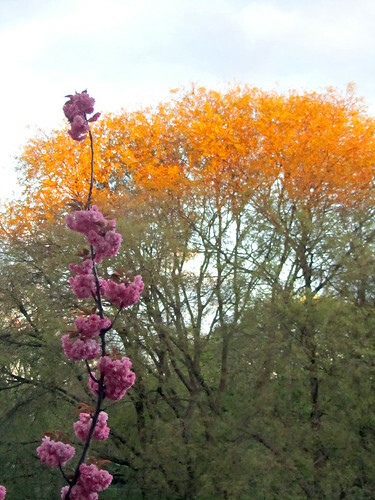 The tall branch of the pink blossoms served to add another layer of colour to the scene. It was so beautiful and tranquil. Take it from me – this photo hardly does it any justice.